What is the quiet Sun? Is it a time-invariant base level or is there secular variability in the Sun’s radiative output? What do those alternate scenarios imply for Earth-climate responses? The current solar minimum provides an opportunity to answer these and related questions. Observations of the Sun and Earth from space have revolutionized our view and understanding of how solar variability and other natural and anthropogenic forcings impact Earth’s atmosphere and climate. For more than four decades the total and spectral solar irradiance and global terrestrial atmosphere and surface have been observed continuously, providing unprecedented high-quality data for Sun-climate studies. 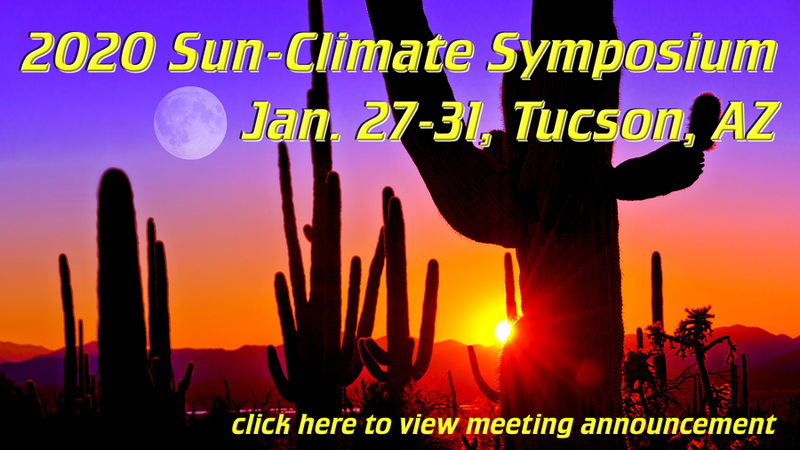 The 2020 Sun-Climate Symposium will convene experts from across the solar-terrestrial community, including the disciplines of climate research, atmospheric physics and chemistry, heliophysics, and metrology, to discuss solar and climate observations and models over both spacecraft-era and historical timescales. The Sunset of SORCE: The NASA Solar Radiation and Climate Experiment (SORCE) has had many accomplishments and discoveries during its 16-year long mission. Amongst SORCE key results are the improved climate records of the total solar irradiance (TSI) and solar spectral irradiance (SSI) with the measurements from its instruments: TIM, SIM, SOLSTICE, and XPS. As recommended from the 2017 NASA Earth Science mission senior review, SORCE is being passivated (turned off) in January 2020 with the successful completion of overlapping the SORCE and Total and Spectral solar Irradiance Sensor (TSIS) missions. This session will highlight SORCE’s achievements and lessons learned. Recent/Space-Era Solar Cycle Timescales: This session is devoted to solar measurements and models covering the last few solar cycles, and the measured or modeled response of the atmosphere and climate to solar variability. Abstracts relating to our current understanding of the quiet Sun are particularly welcome. Secular Trends in the Sun and Sun-like Stars: This session will discuss variability in the Sun and Sun-like stars on long time scales, what we have learned about the ranges of total and spectral solar irradiance variability, and the associated impacts on Earth’s climate. How does the Sun vary on time scales longer than several solar cycles in records of solar activity and from irradiance estimates? What is the solar forcing of Earth’s climate from multi-decadal to millennial time-scales? How typical is the cyclic activity of the Sun relative to Sun-like stars? Observational Predictions: What are expectations for the next solar cycle and what are climate-change scenarios for the upcoming decades? What future measurements are expected to improve knowledge of Sun-climate connections? A New Reference Spectrum for Remote Sensing: Solar spectra are widely used by the modeling and remote sensing communities as the solar input constraint. Uncertainties associated with the solar spectrum measurements can have significant impacts on theoretical and experimental applications ranging from upper atmospheric photochemistry to the full system radiation budget. Various reference solar spectra will be discussed in this session, along with missing solar emission lines and measurement limitations in instrumentation. Looking Ahead — Future Observations of the Sun and Earth: What is planned for the next generation of solar and terrestrial observations? This session will address new Sun and Earth observations, missions and implementation strategies for a next-generation observing system to meet the current and future challenges facing climate change studies.